Cancellation should be done minimum 24 hours ago, otherwise it will be charged for a day to the guests credit card. The Mountain House is in the central part of the Lakeside, not in the main street still very close to Restaurants, Bars, Internet Cafes, Travel and Trekking agencies, Banks and ATM. It is about one hundred and fifty meters inside to east from the Funky Salsa Restaurant near to the Nabil Bank Limited. The Mountain House is easy to access from the Airport, Tourist Bus Park, ACAP counter and Immigration Office. It has a beautiful front garden. Rooms are very comfortable having new furniture with soft, clean bedding and carpeting, all rooms have attach bath with 24 hours warm water heated by solar power. Each room has two big cross windows with sunny private balconies which offer a splendid view of the mountains. 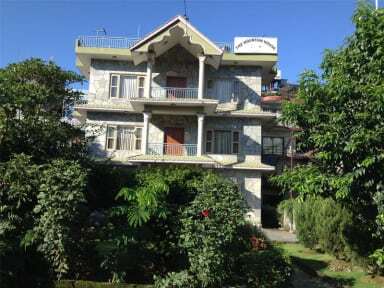 The Mountain House was founded in 1996 in Lakeside 6, Pokhara which is located in a clean and quiet lane of the Lakeside called 'Lalupatemarga'. 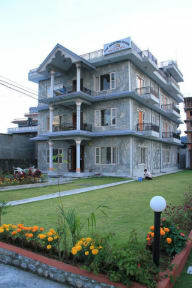 It has been running by a hard working Nepali family where you can feel the complete homely atmosphere. We are specialized in trekking mainly in the Annapurna region.